Millions of readers around the world once picked up their copy of Newsweek eager to explore the stories behind that week’s glossy cover. The writers, editors, reporters and photographers who created each edition shared an even greater excitement. They had experienced the thrills, sweats, agonies and sometimes real risks that placed their first draft of history into the readers’ hands. The great old magazine ceased publication in print on December 31, 2012, surviving in digital form alone on the internet. Newsweek returned to paper and ink on March 7, 2014, delivering long, original reports about topics in the news--“monthly content published weekly,” as editor Jim Impoco explains. We hope he leads it back to glory. What glory there was! From the 1960s through the late 2000s, the three newsmagazines, three TV networks and three newspapers (New York Times, Washington Post, Wall Street Journal) dominated public debate and set the national agenda. Newsweek was often the leader, and shared leadership when it wasn’t. The magazine first identified, described, and sometimes even promoted the civil rights revolution of the 1960s and afterward, the youth revolution, the sexual revolution, the women’s rights revolution, the souring of the Vietnam War, the inflation of the 1960s and stagflation of the 1970s, the Reagan revival, the Clinton revival of the Democrats, the Republican comeback, and the gay rights revolution. In scandals, Newsweek broke the Monica Lewinski story that crippled Bill Clinton’s second term and the Bert Lance scandal that crippled Jimmy Carter’s presidency within months of its start. Newsweek began in 1933 as a competitor to pioneering Time magazine. It achieved its greatness after being purchased in 1960 by the Graham family, which also owned The Washington Post. Alumni of the staff here record some of their memories, tributes, triumphs and blunders in reporting, photographing and writing for the last 60 years of Newsweek in print. For overviews, read Howard Fineman on the magazine’s general impact and Edward Kosner on Newsweek’s “sense of high purpose.” Mark Whitaker, Peter Goldman and Bill Cook, among others, describe the magazine’s award-winning civil rights coverage. Lynn Povich and Eleanor Clift report on Newsweek’s leadership—and wrenching direct involvement in--the women’s revolution. David Ansen outlines the magazine’s pioneering coverage of AIDS and the gay rights movement. Dan Klaidman narrates how Newsweek’s classic team reporting and editing produced its coverage of 9/11 and the war against al Qaeda. Mike Isikoff provides an insider’s take on the magazine’s most sensational scoop, its revelation of the sexual relationship between President Bill Clinton and Monica Lewinsky. Stephen Shepard, Kosner and Robert J. Samuelson describe Newsweek‘s editorial methods and personnel and how issues were actually created each week. Ron Meyerson, longtime cover editor, and Jim Colton report how covers got made and photography displayed. The late Osborn Elliott, the editor of the 1960s and part of the 1970s, penned his own obituary telling how he redirected coverage at Newsweek to make it the “hot book,” a central force in interpreting the issues, traumas and dramas of the nation to readers for the last half of the 20th Century and first decade of the 21st. Among the most startling stories about individual reporting are Wally McNamee’s description of his coverage of the U.S. invasion of Grenada, Arnaud de Borchgrave’s piece on the 1972 Vietnam peace accords, Bill Cook on a battle in Vietnam, Christopher Harper on the suicide of a thousand religious cult members in Guyana in 1978, Rich Thomas on getting scandalous leaks about the Vatican Bank from the Vatican itself, and Andy Nagorski on the last days of Leonid Brezhnev. Chris Dickey provides a war weary catalogue of the dozen wars he covered for Newsweek from 1986 to the present. The other pieces present individual anecdotage showing how key interviews can fall accidentally into one’s lap and how months of investigation can come to naught to how advertising got sold and even how folks got hired and fired. Double Take: Wally McNamee shot this iconic, award-winning Cold War photo at a 1973 poolside reception in Richard Nixon's San Clemente, CA, retreat. Henry Kissinger had just walked away trailing his date, Hollywood actress Jill St. John. 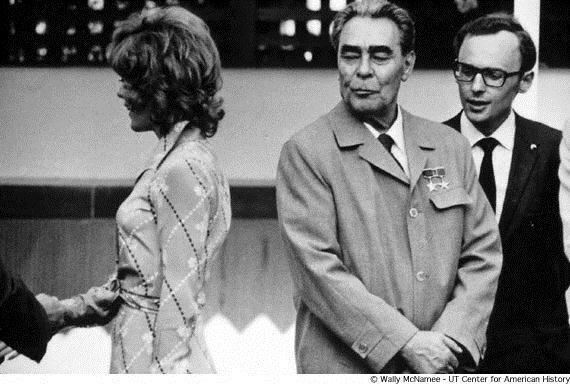 Soviet General Secretary Leonid Brezhnev cast a thoroughly Western eye as his interpreter, according to McNamee, whispered, "Oh, Hollywood, a Bond girl." A celebration—and wake--for the paper and ink edition of Newsweek drew more than 300 former staffers January 14, 2013 to halls at the Graduate School of Journalism of City University of New York. The event, like any reunion, was informal, intimate, and discursive. The speakers, in order of appearance, were former national affairs editor Stephen Shepard, host of the event and dean of the school; Dorinda Elliott, a former writer and reporter and daughter of 1960s-70s editor Osborn Elliott; late 1970s editor Edward Kosner; Susan Fraker, speaking for and about her late husband and 1990s editor Maynard Parker; 1998 to 2006 editor Mark Whitaker; Stephen Shepard on the Newsweek Prize; and Dave Friedman, who organized the event. Here is the LINK to the Speaker videos. Here is another LINK to the videos of historic covers and Newsweek people that were shown at the wake.